Did the Luftwaffe units in N/Afrika use the same yellow colour for their helmets as the army troops? 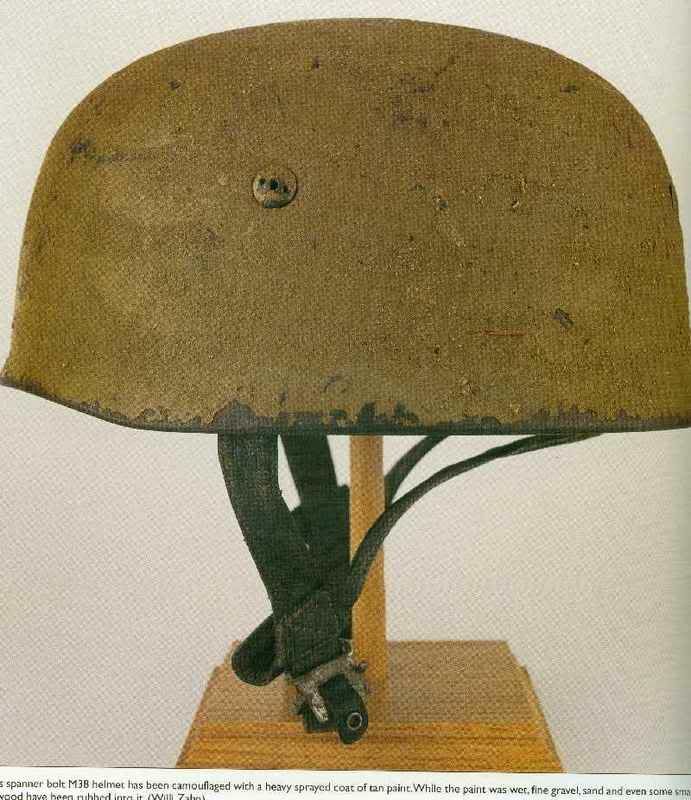 What is the best paint (RAL) to use for a Fallschirmjäger helmet as used by the Ramcke Brigade ? Thanks, was this colour also used on vehicles and other equipment ? And are the RAL numbers the same as those used during the war... ? Yes, this color was also used on vehicles and equipment. The Ral system was revised in 1951 and 1976 (I believe) and some codes were changed or deleted. It's not all the same anymore, but the basic wehrmacht colours were changed little. Ral 1002 is actually Sandgelb, a bit lighter. Might be more of what you are looking for. Original stuff varied greatly in color, from light yellow to mustard brown. Also, different paint manufacturers make paint that comes out differntly. My advice is to buy Wehrmacht restoration paint from the various internet shops, that would be the closest match to the originals. I've spent too much on paint that came out wrong. Don't make that same mistake. V-Important ! troops in the tunis area used a much darker colour, nearly brown as the ground around there is much more darker & less sandy....... for the actual desert areas it was as said above the exact same paint that was used on the vehicles...... an old DAK trick was to add lots of paint mostly by brush then just chuck the sand straight on top of it & leave to dry. instant desert camo & very effective. dont paint over the sand nor mix it into the paint, just add the sand to the wet paint. If you want to age it a bit try to get some 000 grade sand paper the finest you can find & take the edges of from around the rim & a bit from the peak (ie where you would pick it up mostly) also imagine putting the helmet down on a sandy hard surface day in & day out on its top & you will get to imagine the wear pattern you will find on the top of the lid. 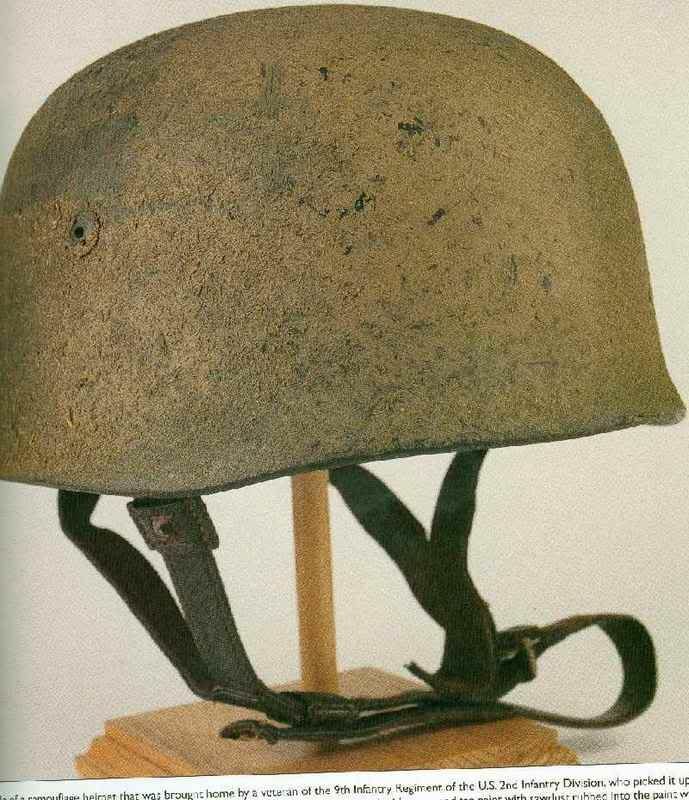 Does that mean that Fallschirmjager helmets also had a other colour in Tunisia (Fsj Regt 5) then by the other Fsj troops of the DAK in Egypth/Cyrenaica (Ramcke)...? There is no "100% perfect" color. As stated before, anything from very light tan, to earth brown will work. My friend owns a M-40 with both decals painted over, and its pink We assume its captured British paint, since many LRDP vehicles were actually painted pink. 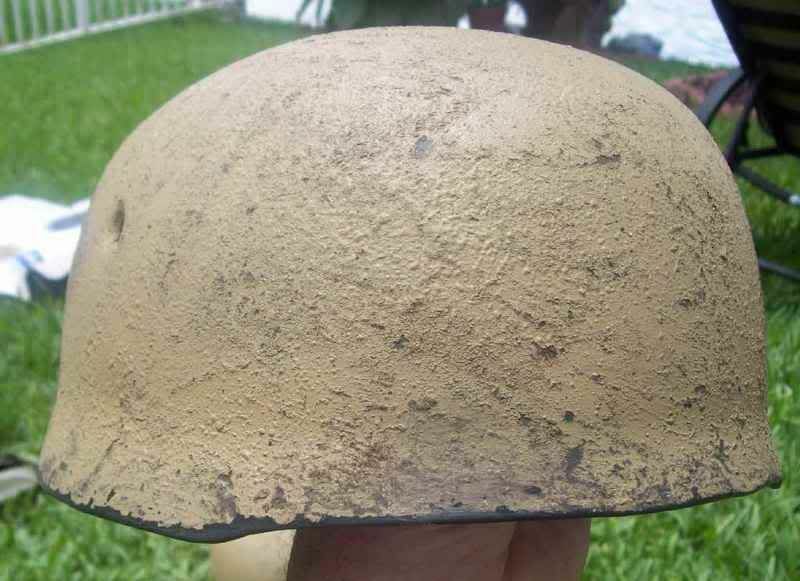 I once seen an original KM helmet from Sicily that was painted orange! (I painted flat clear over the helmet after the photo so it is toned down a bit). Astonishing ! Well done .. ! 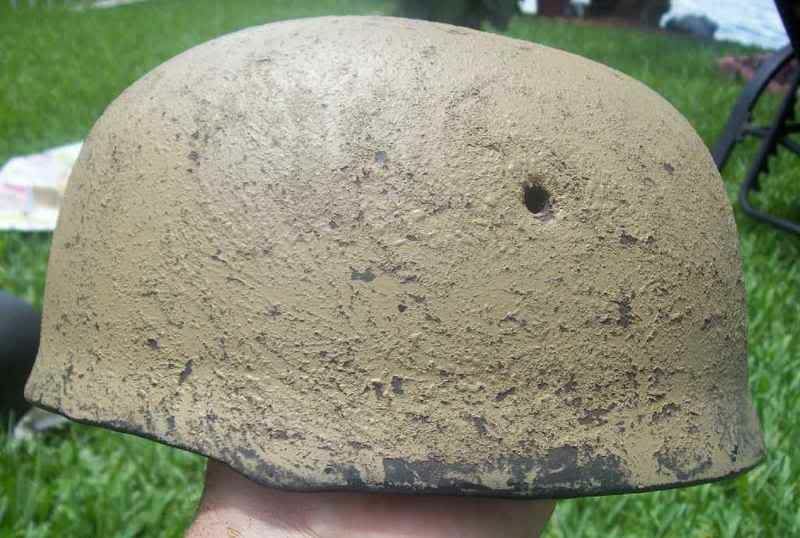 I think you must start up a sevice to do helmets for others against paiment ! Now that is good. Seriously. Leave it as it is. great helmets from all above ! cant fault any of them. most important thing to remember when camo'ing a helmet for north afrika (or anywhere) is that there are NO hard & fast rules ! "most important" think like a soldier !! put yourself in his shoes/boots ! as a soldier you only want a cam paint job to do one thing & one thing alone, hide you in the environment you are in...... have a google around for images of the landscape & try to match your paint job to that.. remember ANY paint will be ok ! brit US or german, not hard or fast rules there, i have even seen crushed rock mixed with water used before ( a pinky sandstone ). but remember ! have fun dont get stressed over it no two cam helmets are ever the same. If you like what you have done then mission accomplished. OK... we have discussed the colour, what about the paint itself... spray or with the brush ? Myself, i would go with a brush, preferably made from the hair of a local camel sorry about that.